Searching for dinosaur party ideas for a kid's birthday? Do dinosaurs have birthday parties? 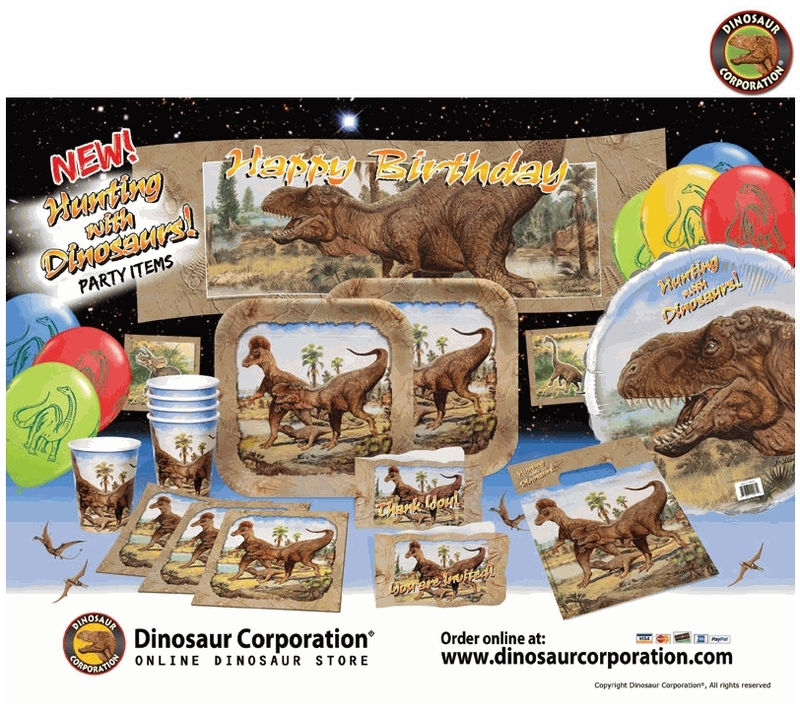 At Dinosaur Corporation they do with these awesome dinosaur party supplies! Kids love dinosaurs. And with Dinosaur Corporation, you can find the party supplies and fun dinosaur accessories that make any party a huge success. Whether you are planning an event for a girl or a boy, you can count on us for everything you need. With dinosaur party favors, napkins, balloons, dinner and lunch plates, balloons, centerpieces and tablecloths, we even carry inflatable Tyrannosaurus Rex lawn decorations and plenty of games, toys, stuffed animals and accessories to keep all the little Triceratops at your home busy for hours! Older children will love our fascinating books, DVDS, dinosaur dig and build-your-own replicas too. *Make sure you mail out your dinosaur invitations at least 2-3 weeks ahead of time to avoid any disappointment. Check with your child's teacher to make sure the date for your event doesn't conflict with another child's special occasion, too. And to be a REALLY kind Velociraptor, why not include everyone from your child's class, even those that might otherwise not get invited. Children are sensitive, and can be easily hurt by a social snub. Including everyone is a great lesson for children in the importance of community and kindness. If space or budget limitations are an issue, consider limiting invitations to friends and family instead of kids from school, especially if you can't invite all the dinosaurs in the class. *Don't go extinct: set a dinosaur budget before you buy. Before purchasing gifts or even making deposits on party locations, know what you have to spend, and stick to it. Remember, the best children's parties don't have to be the most expensive. They just have to be fun! Keep it simple, with easy food and a simple cake. You don't need circus performers-just activities in which kids and adults can participate. *Consider limiting your party time to 2 hours, triceraTOPS! Kids, especially little ones, tend to fade after an hour or two of fun and excitement. Even Tyrannosaurus Rex needs his sleep, as do his parents! Remember to investigate necessary permits, licenses and insurance if you plan to have your event in a public area. *Dinosaur decorations go a long way to make any party space feel fun! We have sturdy, re-usable inflatable dinosaur toys, as well as exciting games, books and puzzles that are guaranteed to please even the most skeptical or shy Tyrannosaurus Rex. We also offer a jungles worth of dinosaur party favors, toys and fun party activities that children LOVE! And don't forget, the Jurassic Park sequel comes out soon...and its Hunting With Dinosaurs theme makes a great party for any age group. We have a giant T-Rex Happy Birthday Party Banner, wall murals, table centerpieces, balloons, and more to make your party goers ROAR! *We just have to mention it because it's the hands down FAVORITE dinosaur party accessory ever- check out our inexpensive dinosaur footprint decals to lead the way into your event. With a few dinosaur eggs, some crepe streamers and these reusable decals, all your party guests will know they are in for a party of prehistoric proportions! *Dinosaur Activities: stick with simple dinosaur games that children may already know or can learn easily. Small group projects, where children are assigned 2-3 partners to complete something are also a great way to get kids to warm up to one another. While you can award prizes, make sure each game offers something even for children who didn't win. For example, our Dinos Pin Game is fun for everyone, and kids love searching for dinosaur eggs too. Our inexpensive dinosaur party favors are a great way to wind down at the end of the party. *Create a memory book or an album of the event too. Everyone loves getting a picture of their own beloved T-Rex, and including a personal photograph from the event in your child's thank you note to a guest is a great way to remember a very special Dinosaur Day! We have Tyrannosaurs Rex photo stands that make wonderful party favors too. We also have fact cards, plastic dinosaurs, stickers, stretchy toys and bath sponges that everyone can enjoy. *Don't forget Dinosaur paper cone hats, dinosaur noses and foam masks for fun as soon as children and adults arrive. It is a great way to participate and break the ice without much effort or expense. Dinosaur Candles are a must have for any T-Rex birthday cake, and everyone will want a dinosaur balloon as well. *Relax and enjoy. Your greatest present to give a child is YOU! Spending time with them and throwing a birthday party of any size that reflects their interest in this fascinating era of our world's history makes you a ROARING good parent or loved one. Remember to laugh, to take pictures, and to let your child know that at the end of the party, love is the most important gift of all.